Nigeria: Achieving Abundant and Affordable Energy in Africa - Is There a Place for Nuclear Power in Nigeria? Nigeria and Russia have signed agreements to set up four nuclear power plants and a Centre for Nuclear Science and Technology in Nigeria. This piece examines the prospects of nuclear power plants to be built in Nigeria by mid-2020, with the view of objectively assessing its cost implications and feasibility. Given Africa's low levels of energy access, supply deficiencies and little contribution to climate change, it can be agreed that energy sources (clean or dirty) is not a question of substitutes but complements. Abundant energy that can be deployed affordably are essential for addressing energy challenges in the region. Two clean energy sources – nuclear and solar – have emerged as a revolutionary source for scaling up energy supply globally. Solar power, on one hand, has become the cheapest and fastest-growing source of electricity since 2011, on account of the surge in Chinese-manufactured silicon solar PV which cut costs by one-third. Nuclear power, on the other hand, supplies at least five times more electricity than solar power. However, occasional symbolic fallouts around nuclear power raises concern about its suitability, especially for third world countries. The meltdown of the three reactors at Japan's Fukushima Daiichi nuclear plant in 2011 after an earthquake and resulting tsunami is one of the two notable symbolic fallouts with nuclear. Opponent's activism, accidents, and rising production costs have negatively affected the receptiveness and growth of nuclear power. As a result, many developed countries such as Germany, Belgium and the U.S are scaling down or exiting plans for new nuclear reactors. Despite fallouts, confidence in nuclear power has been gradually improving due to constant development of safety technologies, including newer designs like Generation IV reactors with design features that take into account the "Fukushima Daiichi lesson". Presently, 56 nuclear power plants are currently being constructed in the world today against 449 in operation. In Africa, the only operating nuclear plant is in South Africa, and it produces 1,860MW of power, contributing to 4% of South Africa's power capacity. 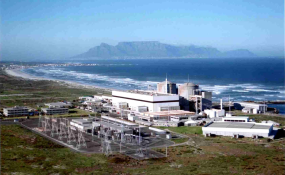 Plans to expand South Africa's nuclear capacity is however opposed by the country's Minister of Energy and the Treasury, on the ground of its implications for national debt. However, more African countries like Egypt, Ghana, Ethiopia, Uganda, and Zambia are establishing agreements with Russia State Atomic Energy Corporation (Rosatom) to build nuclear technologies for peaceful purposes. The Nigeria Atomic Energy Commission (NAEC) has also signed agreements with Rosatom, in 2017 and 2016, to set up four nuclear power plants and a Centre for Nuclear Science and Technology respectively, after a decade of developing the framework. The nuclear project, which is expected to cost about US$ 20 billion and produce 4,800 megawatts of electricity by 2035, will be initially operated by Rosatom before handover (Figure 1 - see original). What are the cost-implications of nuclear power for addressing energy deficit in Nigeria? While nuclear power is relatively more expensive to construct, its maintenance cost is said to be low; as it can operate for about 60-80 years with very little maintenance. As such, it is argued as being more profitable and cost-effective in delivering power in the long run, relative to other sources including gas and solar. However, the prospects of repaying loans used in the construction of the nuclear plants may be daunting for African countries. Although information on the Nigeria-Rosatom nuclear project is scarce, analogy can be drawn from the Egypt-Rosatom agreement in which Rosatom provided a construction loan of US$ 25 billion for the 4.5 gigawatts nuclear project. The loan is projected to have an annual interest of around 3% beginning from the 10th to 13th year after the loan is made for a period of 22-28 years. At repayment, the 3% annual interest could have increased the debt by as much as 40%. The implication is that the country receiving the nuclear plant may pay very little at onset, but the country's fiscal space and electricity consumers could be faced with a massive burden when the repayments kick in. It is argued that most African economies may never be able to meet such debt obligations, given that the possibility of recouping funds from electricity sales is low. Furthermore, the nuclear industry is seen to have a history of cost overruns due to delays in construction, suggesting that the country receiving nuclear plant will likely face a higher-than-expected debt servicing cost. This raises concerns that future debt may position Russia to exert disproportionate influence over the affairs of the debtor country in the long-run. The cost implications of nuclear project should be an issue of concern for Nigeria, given cost-recovery challenges presently faced by power generation companies (Gencos) mostly due to low electricity tariffs that has proven politically and structurally difficult to raise. In addition, the country's fiscal balances remains very susceptible to oil price and production shocks so affordability might be a major concern. How feasible and safe is nuclear power in an economy characterized by inefficiencies? Nigeria has existing nuclear facilities for other purposes except electricity generation. A case in point is the multi-billion naira Gamma Irradiation Facility within the national Nuclear Technology Centre (NTC). However, existing nuclear facilities are barely functional due to several challenges including: government's financial constraints, non-prioritization in energy programme, corruption, and cynicism about the risks of nuclear waste and radiation on health and environment. Despite the challenges, the prospective nuclear power project for electricity generation in Nigeria has been deemed feasible and safe by several stakeholders. Positive evaluation reports by the Inter-Ministerial Committee on the feasibility of deploying nuclear energy for electricity generation in the country, lead to the activation of the NAEC in 2006. Furthermore, reports by the International Atomic Energy Agency (IAEA), following Integrated Nuclear Infrastructure Review (INIR) missions to Nigeria, has been quite optimistic. Several missions carried out between 2015 and 2018 concluded that Nigeria's emergency preparedness and response framework was consistent with IAEA safety standards. The review team often observe notable progress in strengthening the infrastructure for the new research reactors. In addition, a great deal of work has been done to establish appropriate legal framework and educate specialists in the NTC. While standards seem high at onset, maintenance may be an issue especially after the project handover, given historical and current inefficiencies. For instance, Nigeria's current thermal plants are operating below capacity due to poor maintenance and frequent disruptions to fuel (gas) flow. In addition, the country's current installed thermal capacity is 12,500 megawatts, but in practice, it is only 3,200 megawatts. Such inefficiencies reinforces the potential cost implications of the nuclear project. An informed evidence-based arrangement for cost-recovery and loan repayment needs to be made. Practical measures for enforcement, with penalties, need to be erected to ensure that a prospective nuclear electricity tariff/pricing schedule is followed through. This is important for safeguarding loan repayment. A well-thought out plan for securing financial and human resources, needed to maintain the nuclear facilities and safeguard uranium to power the nuclear plants over the long-run, should be crafted. Legal clauses that would guarantee commitment to the plan by successive government regimes should be entrenched in to the framework. Continuous public awareness on the implications of nuclear power on health and environment as well as the need to maintain highest echelon of safety measures must accompany any nuclear power project in Nigeria, even decades after construction. Sustainable measures to ensure that safety of the workers and residents in nuclear site locations must be guaranteed and never jeopardized. Precious C. Akanonu is Research Fellow at Centre for the Study of the Economies of Africa (CSEA). Copyright © 2019 Centre for the Study of the Economies of Africa. All rights reserved. Distributed by AllAfrica Global Media (allAfrica.com). To contact the copyright holder directly for corrections — or for permission to republish or make other authorized use of this material, click here.